When the perspective client arrived with his window that "needed a little work", it was taped and wrapped to a board to keep it from falling apart. We explained that we'd have to completely rebuild the window, so he asked if we could make some design changes while we were at it. We agreed, while securing the added stipulation that we would rebuild it using the copper foil method. 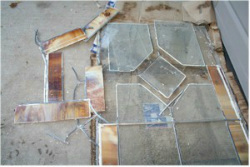 We unwrapped the window and assessed the damage. 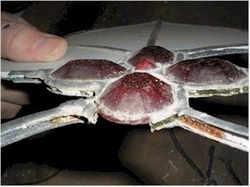 Every joint was weakened and falling apart. The lead was brittle and crumbled quite readily. The age of the thing and it's time riddled damage was quite amazing. The formula for strong lead was lost in the early 1900's and is only now being rediscovered through metallurgical studies. 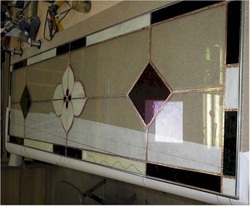 We began to disassemble the panel and laid out the glass pieces on a sheet of paper so we could design the rest of the window to fit the opening that it would go into. The lead was so crumbly that is was fairly easy to pry it away from the glass. 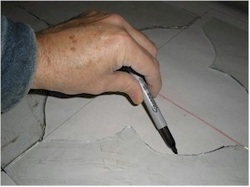 The part left of the cement that held the lead to the glass needed a good scraping to remove it. Using a window scraper, we were able to remove the cement and grime from the glass. 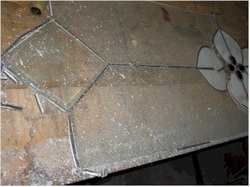 The glass was obviously cut with poor tools. 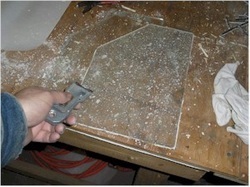 It had very rough edges and the fit never could have been very good, even when the window was new. 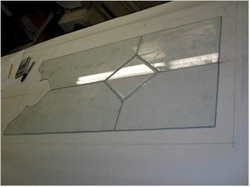 We were able to trace around the old glass onto our pattern to insure a perfect fit when it went back together. 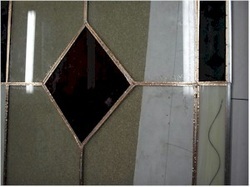 The jewels that were at the center of the panel had been put together using copper foil. 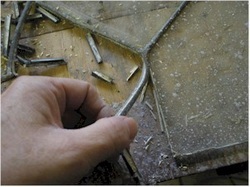 The original soldering suffered from the lack of good soldering equipment. Being blessed to have better tools today, we were able to do a better job putting it back together, that the original artist would have been proud of. 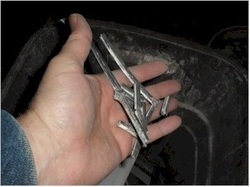 Here is a handful of the crumbled lead. We swapped out the bevels for some red glass at the clients request. 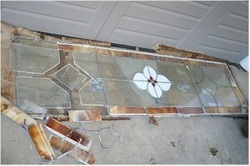 Here's the rebuilt panel, with all the edges replaced with new glass. In truth, only the center jewels and clear glass were saved and everything else needed to be replaced. It would have been easier and more economical (and perhaps prettier) to have built a new window instead of messing about with all the old glass.